Gemstones are the perpetual treasures from the womb of earth. 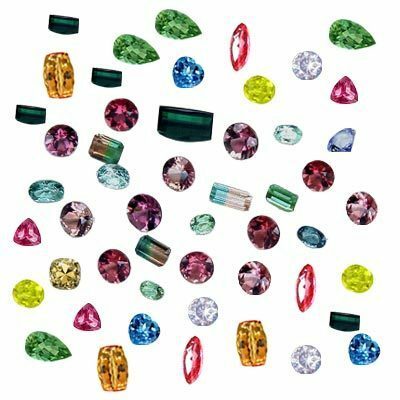 Since millions of years gems have been receiving and emitting cosmic vibrations, owing to their unique chemical and electromagnetic attributes. GEMS have made lives of many individuals happier and more successful. Gemstones according to vedic astrology and also with modern science relevance have both positive and negative impact on the wearer. Gemstones and Vedic astrology affect every aspect of one's life be it any. Gemstones have extraordinary effects on us spiritually, mentally, emotionally, physically, and financially. In fact wearing the appropriate gem does wonders in solving problems, protects from evil influences of planets and enhances their beneficial effect. Worn as pendants and rings, gemstones can help us unlock our potential as human beings by expanding our level of consciousness, calming our stress levels, and infusing our dreams with healing energies. Always wear quality gemstones for Astrological purpose otherwise never wear. Astrology perfect science: Astrology is based on the fact that cosmic force of planets governs human body and life. The cosmic structure (signature) imprinted on us, at the time we were born defines our physical, intellectual, emotional, spiritual, and even karmic self. Not every planet is all-powerful at our birth time, and each planet gives varied effects on each individual. One of the major concerns of an astrologer is to study the horoscope, analyse the effect of each planet (see which effect is lacking or required), and assign the gemstone to enhance the required celestial force in our body and life. The enhancements in the particular planetary vibration we receive from that gem help us to achieve fulfillment in our personality and destiny. As the Gems affects the subtle energy field, which emanates from every living thing, where our energetic and emotional habits, thought patterns, belief systems, and so on reside. The energy pattern of a gem directly affects one's emotional and mental energies, and over a period of time this promotes long-lasting changes. Protective Aura: Gemstones are worn to increase the efficiency or for removal of the deficiency of life aspects like finance, marriage, carrier, fame, luck, income and wealth etc.. These remedial stones act in two ways; one is by its spectrum effects and other is by radioactive effects. When a ring is worn, Gem goes on continuously vibrating its power which is absorbed in the individual aura. The protective aura thus becomes powerful to resist any untoward vibrations coming from external sources. The electromagnetic vibrations of the gems interact with the aura of our body while in touch with our skin. It then forms a sort of productive energy on `union`, which brings about the change in the following spheres of our life. Gems affect our physical well being. The physical immunity is increased, and corresponding gems helps in achieving ineffectiveness from certain ailments. They align a particular Chakra in our body. This not only increases our health, but also enhances the overall energy level of the body to a greater height. Gems direct our emotional and mental faculties, and help in achieving higher grounds by attaining inner peace and wisdom. Gemstones impart a protection from psychic and mental influences (sub conscience healing and strengthening). A gem helps in changing the karmic pattern of the person, in relation with the placement of that planet in a particular house. Gemstone consistently wearing magnificent effects A gemstone brings significant change only when in alliance with the aura of a person. Hence it is advised to wear the stone consistently and not take breaks for a long time. Gems are similar to a lightning rod. They create, what is in effect, a protective field around the body, which regulates celestial forces absorbed by the body. In time, the proper gemstones, if kept in contact with the skin, can bring about miraculous changes in mind and body. Astrology pure science Astrological gems healing is the way to implement remedial measure to achieve overall success in life. Although due to lack of proper scientific research, application of this science is looked upon as superstition, the fact remains that when guided by a good astrologer, scores of people have had immense benefits by these brilliant sparkling stones influencing human destiny. According to Indian wisdom of astrology, the nine main gems acting as the cosmic boon to human life are classified under `Navratna`. I have always suffered losses and ill health on the dates 8th, 17th, 26th and in the months of February, August and December. Kindly advise.